High Spy is the highest of the fells that run south from Cat Bells, sitting at the southern end of that range. The fell puts a rocky front forward towards both Borrowdale and the Newlands Valley, with a single line of impressive crags in the west and a series of lower crags jutting east into Borrowdale. High Spy is shaped like a triangle, with lines of crags guarding the western and north-eastern sides and the rocky slopes of Robin Fold Edge to the south-east. Above the crags is a sloping plateau that rises up to the west, with the summit of the fell sitting above the western crags on a gentle rise. The best feature of the summit area is the walk along the top of these western crags, with dramatic views down into the Newlands Valley. The view east towards Derwent Water is blocked from the summit itself, but the lake comes into view from the top of Blea Crag at the northern end of the summit area. High Spy is best approached from Maiden Moor in the north or from the col above Rigghead Quarries in the south. Both routes bring us past interesting rocky outcrops, before reaching the wider plateau area. 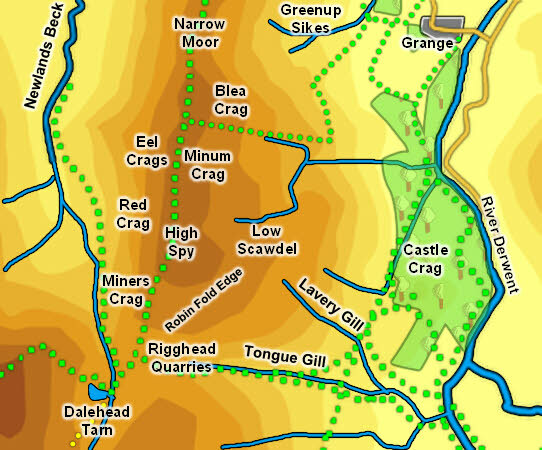 If High Spy is the main target for the day then the southern col can be reached either by following Newlands Beck south past the crags or from Rosthwaite in the east, using the Rigghead Quarry path. In the north Maiden Moor has to be climbed first, along paths from Little Town in the Newlands Valley or up the steep stepped path above Manesty Park in the east. We have one walk that visits the top of High Spy coming from Cat Bells and another that runs below the High Spy crags on the way back from Dale Head. The actual summit is a flat grassy area with a small patch of stone around the well built summit cairn. The western boundary of High Spy is formed by Newlands Beck, which flows north from Dalehead Tarn past the foot of the crags. The western boundary with Maiden Moor is formed by Far Broadgill, which flows down the slopes to Newlands Beck. The south-eastern border is formed by Tongue Gill, which flows east from Rigghead and runs almost directly into the River Derwent. The north-eastern border is formed by Greenup Sikes, which rise in the bowl below Blea Crag and then flow north-east, becoming Ellers Beck. This flows into the Derwent at Fitts Turnhole. The eastern boundary depends on if you see Castle Crag as a separate fell. If you do then the boundary is formed by Broadslack Gill in the south then by the Derwent in the north. If not the Derwent performs that role for the entire eastern flank. The only other named beck on the fell is Lavery Gill, which rises on the south-east slopes then flows into Tongue Gill. High Spy has no named tarns. The remains of the Rigghead Quarries are interesting, and the path down the valley passes through them, but the actual workings themselves can be dangerous.